27.12.2017 For the first time I had something to fight for. Leia Organa: We have everything we need. 27.12.2017 How do we build a Rebellion from this? 27.12.2017 The Rebellion is reborn today. The war is just beginning. 27.12.2017 We are the spark that’ll burn the First Order down. Luke Skywalker: I came to face him, Leia. And I can't save him. Leia Organa: I held out hope for so long, but I know my son is gone. 27.12.2017 I held out hope for so long, but I know my son is gone. 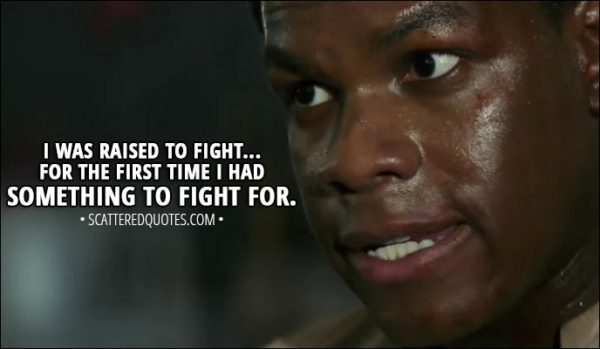 Rose Tico (to Finn): I saved you, dummy. That's how we're gonna win. Not fighting what we hate, saving what we love. 27.12.2017 Not fighting what we hate, saving what we love. Finn: Let's go, chrome dome. 27.12.2017 You were always scum. – Rebel scum. Kylo Ren: Do you wanna know the truth about your parents? Or have you always known? And you've just hidden it away. You know the truth. Say it. Say it. Kylo Ren: They were filthy junk traders who sold you off for drinking money. They're dead in a paupers' grave in the Jakku desert. You have no place in this story. You come from nothing. You're nothing. But not to me. Join me. Please. 27.12.2017 Do you wanna know the truth about your parents? Kylo Ren (to Rey): It's time to let old things die. Snoke, Skywalker. The Sith, the Jedi, the Rebels... Let it all die. Rey. I want you to join me. We can rule together and bring a new order to the galaxy. 27.12.2017 It’s time to let old things die. DJ: They blow you up today, you blow them up tomorrow. It's just business. 27.12.2017 They blow you up today, you blow them up tomorrow. Snoke (to Rey about Kylo): I cannot be betrayed, I cannot be beaten. I see his mind, I see his every intent. Yes. I see him turning the lightsaber to strike true. And now, foolish child, he ignites it, and kills his true enemy! 27.12.2017 Now, he ignites it, and kills his true enemy! Amilyn Holdo (to Leia): May the Force be with you always. 27.12.2017 May the Force be with you always. 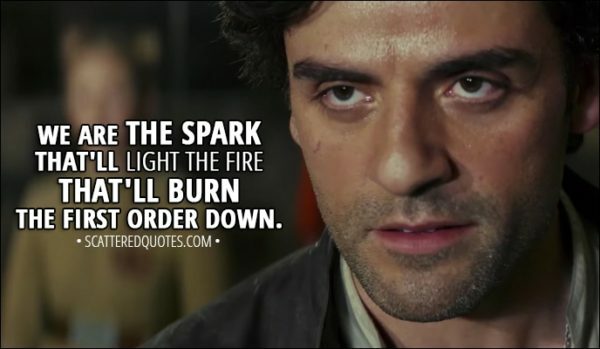 Poe Dameron: You'll never make it through the night. Finn: At least you're stealing from the bad guys and helping the good. DJ: Good guys, bad guys, made-up words. Let's see who formerly owned this gorgeous hunk-uh. Ah, this guy was an arms dealer. Made his bank selling weapons to the bad guys. (hologram shows a tie fighter) Oh... And the good. (hologram shows a x-wing) Finn, let me learn you something big. It's all a machine, partner. Live free, don't join. 27.12.2017 It’s all a machine, partner. Live free, don’t join. Master Yoda (to Luke): We are what they grow beyond. That is the true burden of all masters. 27.12.2017 We are what they grow beyond.